The Prescott College Board of Trustees has approved a landmark Fossil Fuel Divestment Resolution, making a commitment to shift endowment investments from the 200 largest fossil fuel corporations to clean, green energy companies and other socially responsible investments aligned with institutional values. The college is proud to stand behind this resolution as a part of a long-standing commitment to environmental responsibility and social justice. Interim President John Van Domelen Ph.D. 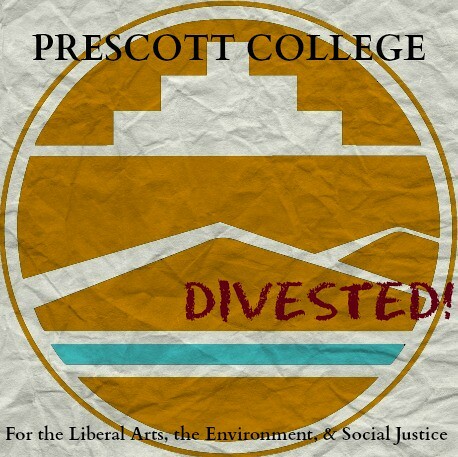 The Divestment initiative at Prescott College was first developed by recent graduate Kara Kukovich, who prepared a report on the ethical, financial and environmental reasons for fossil fuel divestment at Prescott College. The proposed action gained widespread support from students, faculty, staff and Executives at the college, and was approved by all major internal governance committees within a few short months. "We are excited about the Divestment Resolution, it reaffirms our commitment to environmental responsibility and social justice,” said Interim President John Van Domelen, “these have been our core values from since inception nearly a half century ago, long before the emergence of the sustainability movement." The resolution establishes an investment filter to remove the largest 200 fossil fuel corporations listed by the Carbon Tracker Initiative, over the next 3 years, as a means to apply core values with a goal of reducing risk while increasing financial and social return on investment. The college also included a clause to engage in advocacy encouraging current investment managers to develop fossil free investment fund products that would also serve their other clients. Divestment of fossil fuel investments builds on previous climate action, as the college was one of the first signatories to the American College and University Presidents' Climate Commitment, the higher education protocol for reducing institutional and global greenhouse gas emissions. A long-term Climate Action Plan is also in final stages of development, with a comprehensive series of projects to minimize greenhouse gas emissions through investments in energy conservation, renewable energy, and carbon offset origination. Earlier this year, the college was awarded LEED™ Platinum certification from the US Green Building Council for a new, high efficiency student housing facility, the Village, that has recently been confirmed as "net zero" for electricity: generating more solar power than it consumes for heating, cooling, plug loads and lights, while powering other campus buildings and reducing the overall campus carbon footprint. "Divestment is a next step that makes sense for our Prescott College’s ethos,” said James Pittman, Prescott College alum and Director of Sustainability, “we are fulfilling our mission and changing history, encouraging students to think critically and act ethically with sensitivity to both the human community and the biosphere." Prescott College was one institution among hundreds in public and private sectors considering divestment for climate action, and now proudly joins a pioneering group of a dozen other colleges and universities, 7 major metropolitan cities and 15 other municipalities, 2 counties and over 20 religious institutions that have committed to a Divestment Resolution. Global climate change from human-caused greenhouse gas emissions is a tremendous risk source for humanity, with potential to significantly disrupt economic, social and environmental stability on the planet. Divestment campaigns are a central strategy for social change in response to climate change, and are being promoted by 350.org and other organizations. These strategies are based on success of similar approaches used in the 1970s and 1980s to encourage the South African government to shift from Apartheid to policies based on racial equality and fair governance. A full text version of the Prescott College Fossil Fuel Divestment Resolution will be publicly available for use by other institutions taking action in response to climate change.